Leading MEP declares Parkinson’s "a European priority issue"
Speaking at a high-level workshop hosted by the European Parkinson’s Disease Association (EPDA), Marian Harkin, MEP and chair of the European Parliament’s Interest Group on Mental Health, Well-being and Brain Disorders, discussed the “extraordinary impact” of Parkinson’s and called it “a European priority issue”. 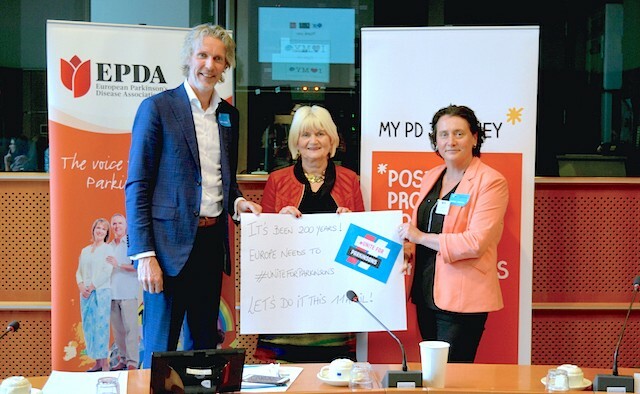 Harkin was among the lawmakers, stakeholders and other Parkinson’s activists – including Professor Bastiaan Bloem – who were invited to the workshop held at the European Parliament in Brussels, Belgium, by the EPDA to mark the 200th anniversary of the discovery of Parkinson’s disease. Just in time for the #UniteForParkinsons campaign, the event brought together 30 members of the Parkinson’s community from EU institutions, Parkinson’s healthcare facilities and several leaders of national Parkinson’s associations, advocating for a stronger policy response to Parkinson’s at the European level and promoting a new Parkinson’s rating scale developed by the EPDA and its partners. Professor Bastiaan Bloem, medical director of the Parkinson Center Nijmegen in the Netherlands, presented a talk on the future of Parkinson’s healthcare partnerships. He acknowledged that Parkinson’s disease is here for the next few decades and that while others are working on the cure, he is working on the care in the form of the multi-disciplinary treatment programme ParkinsonNet, of which he is a co-founder. He said: “An integrated healthcare approach enables leaps in the levels to better quality of care with fewer disease complications. The cost of Parkinson’s healthcare in the Netherlands is going down by €30 million each year”. Knut-Johan Onarheim, president of the EPDA, said: “This year marks the 200-year anniversary of the discovery of Parkinson’s by James Parkinson. There are more than 1.2 million people living with this appalling condition in Europe, a number that is set to double by 2030. Rising prevalence is compounded by significant hurdles to timely diagnosis and individualised treatment and care, including a lack of education of non-specialist clinicians and poor coordination between members of the multidisciplinary healthcare team. 1. Enhancing access to timely diagnosis, appropriate treatments, individualised care and essential social services. 2. Empowering patients to take an active role in decisions about their treatments and care pathways by promoting a bottom-up approach to healthcare. 3. Improving employment conditions and reducing social stigma. 4. Addressing fragmented healthcare and sharing good practices across Member States. 5. Supporting quality of life and cure research through continued funding. 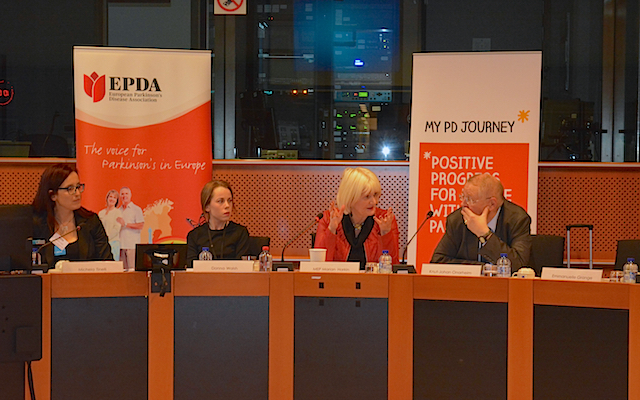 ‘My PD Journey’ is a multi-stakeholder European coalition – led by the EPDA –working towards improving the lives of people living with Parkinson’s disease. Their mission is to enable tailored care for people with Parkinson’s throughout their journey. 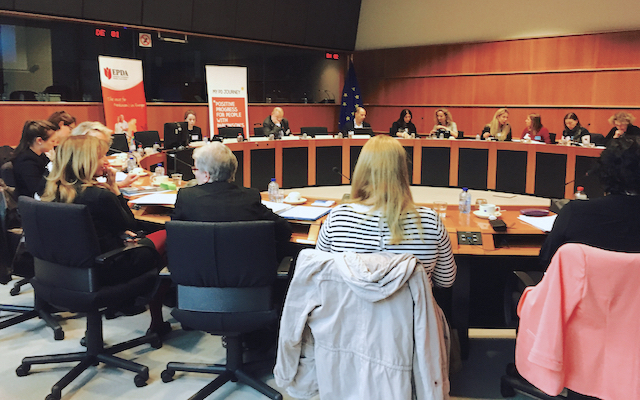 The initiative involves representatives across the entire Parkinson’s disease community – including European umbrella healthcare organisations, people with Parkinson’s, carers and members of the multidisciplinary healthcare team. The EPDA pledged to continue to advocate for a stronger policy response from the EU and national governments, and will work closely with its members, representatives of the EU institutions and its partners to achieve its objectives in the short, medium and long-term. This is the focus we need on Parkinson Disease and it’s impact on individuals with the disease, their families and Society. Europe is leading the way ahead. Prejudice, fear, feeling like you are less worthy/useful needs to be addressed eg providing protection of employment rights that are already in place for other chronic conditions. We have a shortage of Neurologists across the UK but especially in the South East that will significantly impact the care we will all receive, and as our numbers swell with the predicted increase in prevalence of this life changing (stealing) disease.